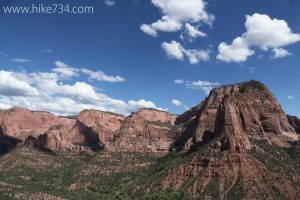 In the remote northwestern corner of Zion National Park, the Kolob Canyons Road winds its way past a hall of towering red summits in a variety of unique formations. This drive is wonderful and worth the trip in and of itself. The Timber Creek Overlook Trail is located at the terminus of this drive. The parking lot has fantastic panoramic views and interpretive signs. The red cliffs to the east proudly rise above the forests below with tall trees clinging on impossible ledges. The trail starts at the west side of the parking lot. A couple hundred feet up the well maintained trail is a shaded picnic area. The trail continues and works its way up on a ridge with little shade. 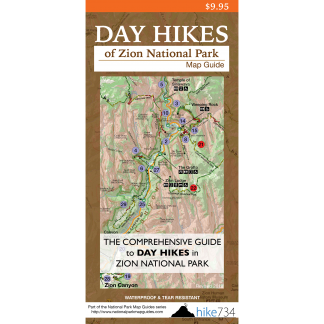 After a short, half-mile climb, the trail’s terminus features a nice overlook down into a valley to the west, a canyon rim to the south, and Timber Creek below to the east. The red cliffs tower over the creek and speak to the immensity of the area and the results of the Hurricane Fault. Trailhead: Take exit 40 between Cedar City and St. George on I-15. Head east past the Kolob Canyons Visitor Center up the Kolob Canyons Road. Follow the road all the way to the parking lot at the end.